Hey everyone. I know this topic has been beaten to death, but I am trying to get my mute button to work. I have the KDC-998X and it has a dedicated Mute (brown wire). I also read on the forum that we can tab the pin 14 (green/blue?) from the harness to a relay to reverse the polarity, which should work. I tried it with no luck. I am wiring the pin 14 to pin 86, grounding 30 and 85 and sending 87 to the Mute wire on the deck harness. Am I missing anything? Your wiring looks correct (despite my originally misreading your schematic). It's possible the mute circuit is blown - do you have +12v on the trigger (pin 14) when the mute button is on? Here are a couple maybe useful threads. Last edited by oth; 01-22-2018 at 06:57 AM. Reason: oops! 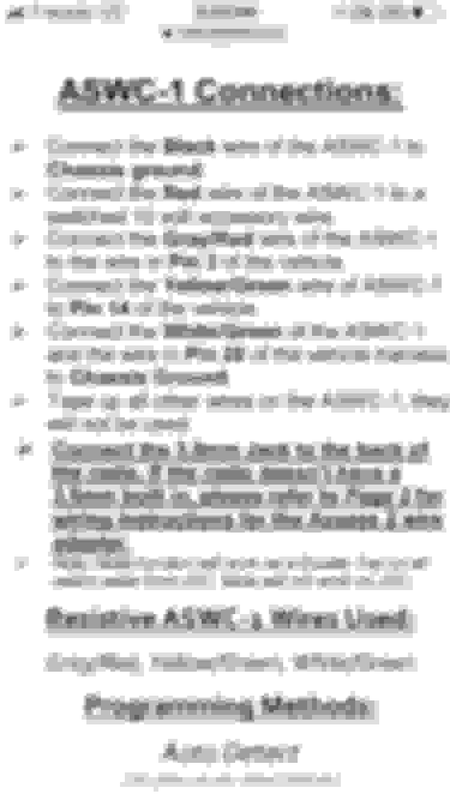 1) A deck that has a dedicated Mute/ATT. Ex, the Kenwood KDC-X998 has it. 3) Done -- Enjoy your mute. No relay need. I have same KDC-998X,I hook up the brown wire to pin 14, and it worked! now the problem is, once you press Mute button head unit initia ATT mode which lowers the volume, it will only cancel when I hit volume up button, same Mute button won’t cancel ATT mode. After cancel the ATT mode with volume up, pressing the Mute button don’t initiate ATT mode. like the mute button only function once. does your mute button do this? Does it mean you have both brown wire from headunit and Green/Yellow wire connect to pin 14? Not sure if this is what you're already doing, but according to this thread you need to hit the mute button twice each time to toggle on/off with the ASWC-1. Once I Mute the system once, the mute button went dead with no response, I can see the green indicator light on mute button comes on and off, but does nothing to the headunit. So if I followed the instructions correctly, i should have Brown wire from headunit and Green/Yellow wire from Aswc-1 both to the Pin14 right? to mute. This is sometimes called "TEL/MUTE"
2) "software" where it's a command on the remote control just like volume up/down, and does not have it's own wire. Some headunits support one or the other, some none, and some both. signal from the mute button to a -12v (ground). +12v the brown wire is sending is confusing it. When you disconnect it, make sure to leave no exposed copper wire to avoid shorts! the part I need to reassure is what color wire goes to pin14? You are suggesting white/green to pin14, then where do Yellow/Green wire go? also be hooked up, but I mistakenly switched the other wire's color when I typed from memory. I have corrected my above post. Hey Oth, nothing to be sorry about, I read few post, some even dated back to 2011 by you, very good information, thank you for your continuous contribution on s2ki!! So today, I pulled my head unit out, I had both yellow/green and Kenwood brown connected to pin14. which confused the system and only allow mute once, then I decide to try connect only Kenwood Brown wire to pin14 and viola!! Mute button worked like it should! 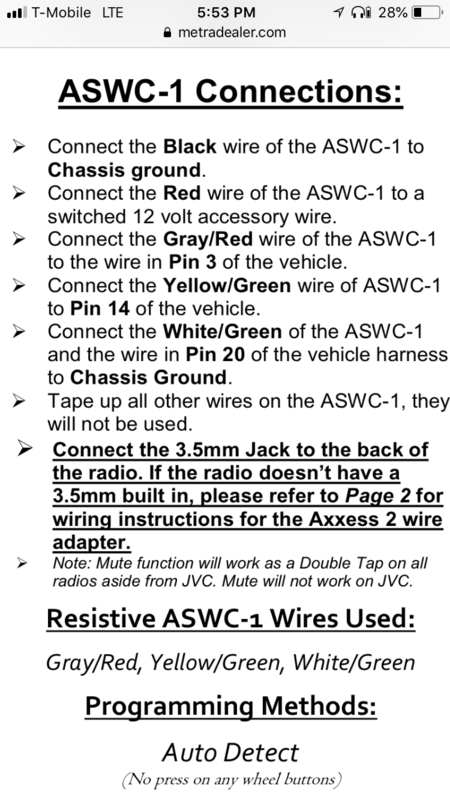 Disregard the ASWC-1 manual do not connect yellow/green from ASWC-1 instead feed mute wire from headunit to pin14. Thanks everyone for the help, and hope this thread will help out those having issue with their mute button.